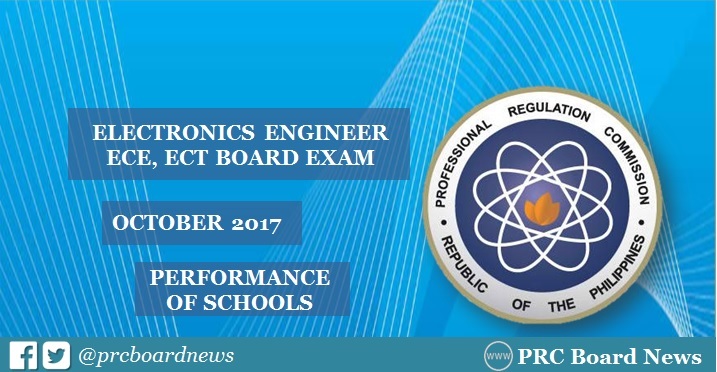 MANILA, Philippines - The Professional Regulation Commission (PRC) recognizes the top performing schools in the October 2017 Electronics Engineer (ECE) and Electronics Technician board exam. The result is expected to be released today, October 27, 2017 or in four (4) working days. University of the Philippines (UP) - Diliman topped the schools in the ECE board exam with 98.33% or 59 out of 60 takers successfully hurdled the tests. Meanwhile, University of Santo Tomas (UST) and Technological University of the Philippines (TUP) - Visayas tied as the top performing schools in the ECT board exam garnering 100% passing rate. PRC administered the licensure exam in the cities of Manila, Baguio, Cagayan de Oro,Cebu, Davao, Lucena and Tuguegarao on October 21 and 22, 2017 for ECE and October 23 for ECT. In the same period last year, University of the Philippines (UP) - Diliman was the lone top performing school for Electronics Engineer board exam garnering 100% passing rate or all 53 examinees passed the series of tests. Meanwhile, the University of Santo Tomas (UST) got the highest place in the Electronics Technician exam, 98.85% or 86 out of 87 passed. In the October 2015 ECE board exam, UPD was also named as the top performing school, 86.96 % or 40 out of 46 passed. De La Salle University (DLSU) - Lipa topped the schools for ECT after its 98.11% passng rate or 52 out of 53 passed the exams.